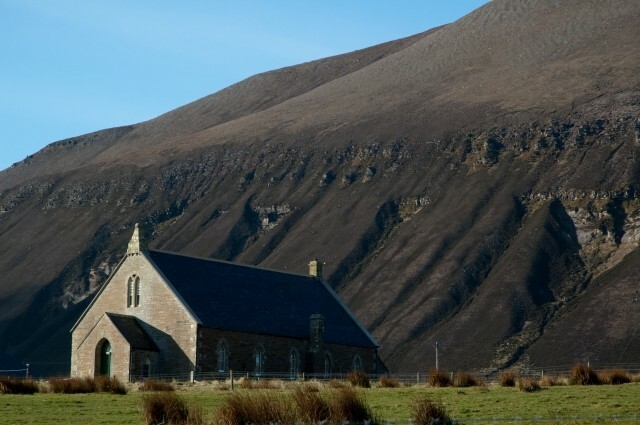 The parish of Hoy (population approx. 40) situated in the north end of the island of Hoy covers Rackwick, Moaness and Braebister and extends about 9 miles to the grave of Betty Corrigall on the boundary line of North Walls. Hoy Kirk, built 1892 served the parish and continues to do so as a venue bought by the community. After renovations, Hoy Kirk Heritage Centre was established in the old parish church. The building retains much of its character with the old gas lamps and carved wooden pulpit with panels that predate the church and believed by some to have been wreckage from the Spanish Armada. The wooden cross above the pulpit was made by the local customs and excise officer, out of wood taken from HMS Vanguard, blown up on her moorings in Scapa Flow in 1917. The community have amassed local heritage through photographs and documents, books and films, interviews and newspaper clippings. As well as the permanent collection, there are exhibitions and events. Here you will find a stairwell dedicated to the story of the Old Man of Hoy, panels of information relating to the Dwarfie Stone, Hoy weather, botany, shipwrecks and exhibitions of Hoy archaeology. Films of Hoy people give an insight in to the character of the parish. The community continue to add to the collection and there are new exhibitions each season. 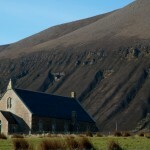 Regular evening events at Hoy Kirk are advertised through the events calendar on this website. Every event guarantees a warm welcome, usually with soup and wine, and fits in with the Friday evening ferry service from Stromness. The programme varies between local history, art and science talks, live music, natural history, or themes suggested by our exhibitions, always wrapped up in a social evening.